High-Intensity Interval Training is a training technique based around quick, intense exercise bursts followed by a short rest and recovery period. Not only is it diverse and time-efficient in nature, HIIT has also been scientifically proven to improve both your cardiovascular and metabolic health, leaving you feeling as healthy inside as you look on the outside! What's not to love? Keep time with the 3D Model from any angle. The reps have been tailored to your level! The Work: Rest ratio varies with your level; although you'll always wish this part lasted longer! There is lots of exercise variety for all levels. But watch out, the techniques get more challenging as you progress. Learn how your body responds to the effects of exercise. Gain a deeper understanding of the physiological effects of working out. Use the 3D model to explore your muscle regions and find invaluable information on the anatomy, wellbeing and common injuries related to your focus area. Want to know the effects of exercise on your brain? 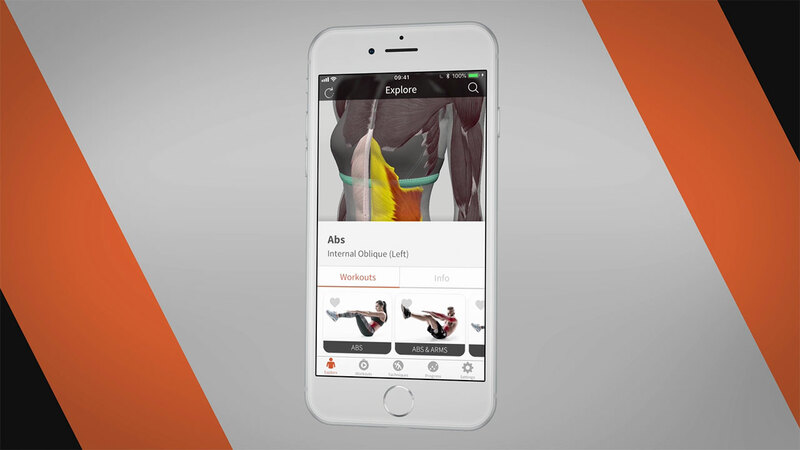 Engage with interactive animations to learn how your body reacts to your workout. Choose focused HIIT workouts made by our team of fitness and medical experts to best suit what your body needs. Perfect form. Our stunning male and female 3D models allow you to explore each exercise in full 360°. Perfect your technique, focus on your form and follow the countdown timer. Go 360°. Get perfect form. Use the 3D model to check out all of our carefully selected techniques from any angle and get practising! Move your body. Follow the countdown timer, the 3D model's rep and rest times and audio cues to work your body the way it was designed to be worked. Stretch goals. Round off your HIIT workout and combat injury with a series of expert-led stretches. Follow the guide to avoid or explore to discover the most common injuries. Pair them with the best stretches recommended for recovery. Not sure where to start? Don’t panic! Your coach will schedule a routine for you to fit with your level and when you want to work out. He’ll even send you reminders so you never miss a session! Keep you on your toes. Track your Progress by hitting personal goals, slamming challenges and collecting badges along the way. Keep track of workouts you've done and check out recommendations scheduled for you by your coach. You can even adapt them to your preferences so you're ready to go. Win badges by smashing HIIT challenges. Collect them all for supreme bragging rights. As you build your fitness you can start shooting up through the levels. Your coach will advise you when it's time to push yourself up.